Newfoundland and Labrador is the ninth-most populous province in Canada with 519,716 residents as of 2016 and is the seventh-largest in land area at 370,514 km2 (143,056 sq mi). Newfoundland and Labrador has 271 municipalities including 3 cities and 268 towns, which cover only 2.2% of the territory's land mass but are home to 89.6% of its population. 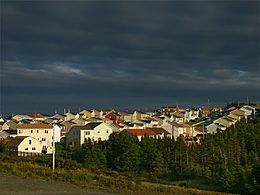 Towns are created by the Government of Newfoundland and Labrador in accordance with the Municipalities Act, 1999, whereas the three cities were incorporated under the City of Corner Brook Act, the City of Mount Pearl Act and the City of St. John's Act. These acts grant the power to enact local bylaws and the responsibility to provide local government services. St. John's is Newfoundland and Labrador's capital and largest municipality by population with 108,860 residents and land area with 445.88 km2 (172.16 sq mi). Tilt Cove is its smallest municipality by population with five residents, and Brent's Cove is the smallest municipality by land area with 1.02 km2 (0.39 sq mi). Newfoundland and Labrador had three cities as of the Canada 2016 Census. St. John's is the provincial capital and largest city by population with 108,860 residents. 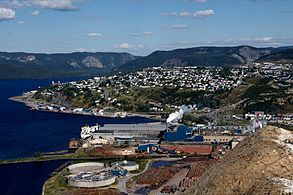 The City of Corner Brook is the largest community on the west coast of the island of Newfoundland. The three cities are governed under their own provincial legislation – the City of St. John's Act, the City of Mount Pearl Act, and the City of Corner Brook Act – which give them the power to enact local bylaws and the responsibility to provide local government services. Newfoundland and Labrador has 268 towns. Newfoundland and Labrador's largest town by population is Conception Bay South with 26,199 residents and the largest by land area is Baie Verte at 371.09 km2 (143.28 sq mi). Tilt Cove is its smallest town by population with five residents, and Brent's Cove is the smallest town by land area with 1.02 km2 (0.39 sq mi). Towns are incorporated under the Municipalities Act, 1999 which grants towns the responsibility to provide in whole or in part local government services and a town council. ^ a b c d e f g "Population and dwelling counts, for Canada, provinces and territories, and census subdivisions (municipalities), 2016 and 2011 censuses – 100% data (Newfoundland and Labrador)". Statistics Canada. February 8, 2017. Retrieved February 11, 2017. ^ a b c "Municipalities Act, 1999". Government of Newfoundland and Labrador. Retrieved 2015-06-30. ^ "City of St. John's Act". Government of Newfoundland and Labrador. Retrieved 2015-06-02. ^ "City of Mount Pearl Act". Government of Newfoundland and Labrador. Retrieved 2015-06-02. ^ "City of Corner Brook Act". Government of Newfoundland and Labrador. Retrieved 2015-06-02. 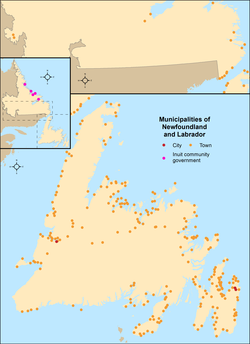 ^ "List of municipalities - Newfoundland and Labrador". Statistics Canada. September 6, 2013. Retrieved June 4, 2015. ^ a b c d e "Population and dwelling counts, for Canada, provinces and territories, and census subdivisions (municipalities), 2011 and 2006 censuses (Newfoundland and Labrador)". Statistics Canada. April 7, 2015. Retrieved June 4, 2015. ^ a b c d "Interim List of Changes to Municipal Boundaries, Status, and Names From January 2, 2011 to January 1, 2012 (Table 1 - Changes to census subdivisions in alphabetical order by province and territory)" (XLSX). Statistics Canada. November 14, 2012. Retrieved December 3, 2012. This page was last edited on 18 January 2019, at 05:43 (UTC).